Kraco Floor Mats were manufactured in the USA from the mid 1950's to late in the 20th century by Kraco Enterprises of Compton, CA. Maurice Kraines started the company and involved most of his family in his desire to provide automotive accessories for the users of those new fangled automobiles. 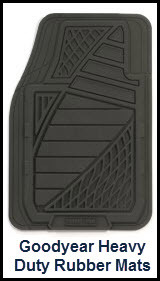 Kraco Floor Armor Car Mats - the Ultimate Protection for your vehicles floor. Kraco's first product in 1954 was a Snap-On Whitewall for car tires. That's so your Grandpa's '54 Chevy, Ford or DeSoto could cruise in real style even if all he could afford were generic looking blackwall tires. Other early products included CB radios, CD changers and steering wheel locks. Today Kraco has a 500,000 square foot distribution facility in Compton, California from where they distribute not only their famous car mats but also other products like steering wheel covers, seat covers, vehicle sun shades, rooftop cargo carriers, car air fresheners and Mossy Oak utility mats - just to name a few. Kraco was acquired by Sun Capital Partners in 2008 and currently sources car mats from China. 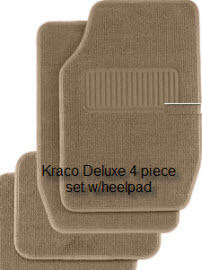 Kraco distributes their carpeted, rubber and specialty floor mats through such retailers as Walmart, Sams Club, Amazon, eBay, Sears and about 15,000 other retail locations in the US and Canada. But don't worry Kraco has a mat for you from their inventory of 3+ million cubic feet of boxed up, ready for sale mats in Compton, just in case the weather gets really, really bad. Enough history! Let's get down to business. 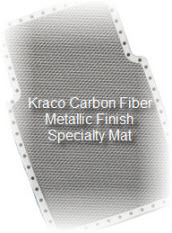 Kraco distributes carpeted, rubber, carpet/rubber and specialty logo floor mats under the Kraco, Goodyear, Auto Expressions, Floor Armor, Eco Essential and Mossy Oak brand names. They even go so far as to put some of your favorite logos on several of their models. The Kraco floor mats product line runs the gamut from very inexpensive 2 mat sets that you can pickup online for a 20 spot or less to more expensive, plushier carpeted mats that could set you back a minimum wage days pay. Anyway, here's some info on Kraco Floor Mat's major car and truck floor mat product lines. Kraco distributes carpeted mats bearing the Kraco, Auto Expressions and Eco Essential brand names. The Kraco Deluxe Mats (2 front - 2 rear) are manufactured using a double sisal weaved carpeting and provide great protection from dirt, stains and wear. The driver's mat has a heel pad to help stop your heel from wearing a hole in your floor mat. The nibs on the back of the Deluxe Mats prevent mat slippage. The mats are UV and stain resistant and you can get them in grey, black or tan. The 4 pc Scotchgard Premium Mat set from Kraco Floor Mats is the cats meow of universal fit car and truck mats. You get plush carpeting, UV fade and stain resistance, and a really nice web binding around the edge. These mats are similar to their more expensive custom fit cousins as far as quality of material but are universal, one size fits all mats. If you can deal with the one size fits all thing, this is a great, inexpensive way to protect your vehicles floor. Eco Essential's Carpeted Car Mats are manufactured from 100% recycled, all weather materials. There's a big heel pad on the drivers mats to prevent your boot from holing your mat. Anti-skid nibs on the back prevent the mat from slipping. These mats come in tan, black or grey and make you feel "earth friendly" while you motor down the road. You get 2 front and 2 rear mats to keep everything in balance and even. Rounding out Kraco's offering of Logo Carpeted car mats are the Flutter and Wild Cherry Carpeted Mats from Auto Expressions. Both the Flutter and Wild Cherry mats come in sets of two that will add a lot of color and life to the inside of your vehicle. Butterflies(Flutter Mats) and Wild Cherry images are embroidered on lush carpeting and are so colorful they just seem to jump out at you. Nibs on the backing of these mat help prevent mat slippage. Kraco also has Auto Expressions matching seat covers and steering wheel covers just in case you really want to be stylish. Kraco distributes rubber car floor mats bearing the Kraco, Goodyear and Floor Armor brand names. 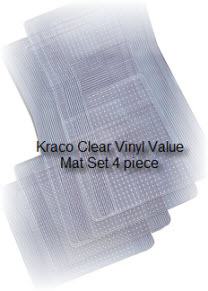 The Kraco Premium Rubber 4 piece mat set in black, grey, clear or tan gets you some really nice heavy rubber mats for a great price. The mats have a raised border, nibs on back to prevent slippage, and a heel pad. 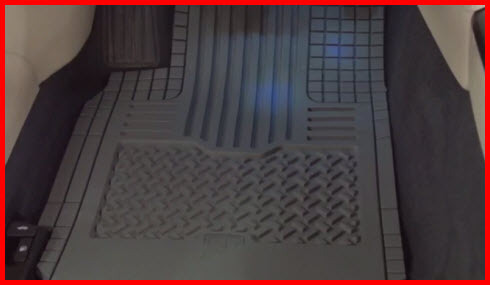 They trap a good amount of dirt, gunk and water between the mats' ridges and valleys. Wash them off with gentle soap and hose. You can trim these mats using the trim lines so considerately provided by the Kraco designers. I always have a set of these mats to use as spares. The Kraco Two-Tone Rubber Car Mat features a 4 piece mat set ( 2 front - 2 rear ) that comes in Grey or tan. A raised border keeps the liquids and dirt on the mat instead of on your car floor. Rubber nibs on back keep the mats from slipping. But why do they call them Two-Tone? Well, just because the heel pad on the drivers mat is BLACK! Contrasty, huh? Style at the price of a universal mat is what I say. Diamond Plate Rubber Car Mats from Kraco fulfill your need for a tough feeling car mat. The diamond plate texture helps direct liquids away from your shoes, while making the mats look "tough". There's a raised border to further trap the bad stuff from your shoes and 2 rib-molded heel pads to make sure your shoes or boots have a cool, dry landing spot on the mat. You get two mats in a set that you can trim to proper size and shape. Better yet, they come in Clear, Black, Tan and Grey. Goodyear Heavy Duty Floor Mats come in 4 piece sets. Black, Tan and Grey are the color choice. A deep pocket design with three different "zones" designed to trap dry stuff, wet stuff (like snow) and water keep your feet and carpet clean and dry. Anti-skid nibs on the backing prevent mat slippage. A unique tread pattern and heavier than normal construction justify the premium you pay over a Kraco Premium Rubber Mat. Trim lines help you fit these mats to the shape of your cars' floor. Goodyear Multi-Season Mats in black, clear, tan or grey are general use mats for most any weather condition. A raised rib design (actually several rib designs combined on 1 mat) channels dirt and water away from your feet. The heel pad is of a contrasting color to make both you and your car floor stylish and scare away water and gunk. Kraco and Goodyear Premium Carpet and Rubber Car Floor Mats are both 4 piece sets. Both use unique patterns of carpeting and rubber mat to trap dirt, water and other bad stuff that comes off your shoes or boots. You can get either set in Black, Grey or Tan and they come with heel pads. Both are made of UV and stain resistant materials so they look good even when they get some heavy use. The Kraco model uses 100% recycled carpet and may be trimmed to fit your floor pan. Anti-skid nibs used to prevent mat slippage are found on both models. It's like a photo finish at the racetrack. What do you buy - the Kraco or the Goodyear? Rubber and Vinyl Mats : Kraco Floor Mats rubber and vinyl car/truck floor mat line is extensive and mostly inexpensive(say that 3 times real fast if your can!!!). Just like carpeted mats, the rubber and vinyl prduct line from Kraco used to come in Premium, Deluxe and Value mats. They manufactured a complete line of Goodyear universal fit rubber mats with all kinds of features and even a heavy duty carpeted mat offering with the Goodyear name on it. Not to be outdone by the environmentalists, so common in California, Kraco manufactured a line called ECOessential. These mats were made of a high percentage of recycled material, both rubber and carpet. What better way to support your favorite tree than to purchase one of these nib backed mats. Wow!!! Did I forget to mention that the ECOessential product line also included a mat made of natural seagrass fibers beautifully woven together and sporting a nibbed backing and woven edge binding. Now just think, if you run out of smokes, this mat has got your back covered - but please note, this feature is only available in California. You might still be able to pick up these mats at one of the large on-line retailers or on special at Walmart. Other specialty mats from Kraco included earthtone and dolphin logo mats, a carbon fiber metallic finish high performance mat and various floor and cargo mats for your van, pickup truck or SUV. I haven't seen these mats available for a long time now but you still might be able to find them on-line. Note : When you shop for Kraco Floor Mats carpeted and rubber/vinyl mats be aware that most of these sets include front and rear mats (4pc sets) with only a few being 2 pc sets. The specialty mats on the other hand are pretty equally divided between 2 pc and 4 pc mat sets. Just be aware of what you are buying for that unbelievable price!! !